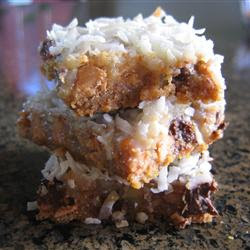 These are called 7 layer bars because you just layer the 7 ingredients needed. Very simple and so delicious, they just fly of the plate. Place butter in 13 x 9 inch pan and melt in oven. Swirl to coat bottom and sides with butter. Spread graham cracker crumbs evenly over bottom of pan. Layer chocolate chips, butterscotch chips, and nuts over crumbs. Pour condensed milk over nuts. Sprinkle coconut over condensed milk. Bake until edges are golden brown, about 20 minutes. Let completely cool and then cut into even squares.